The first workshops I'm teaching in 2011 are coming right up next week at Ink About It in Westford, MA. On Friday, January 7, it's the Panel Book, which is a special kind of accordion structure. We'll begin by creating a couple of simple accordions, and then move on to the panel book. 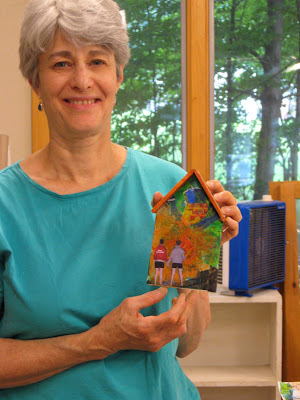 Saturday's workshop is the Dream House Collage, in which we make a collage house structure using foam core. I know Sue Bleiweiss, from The Sketchbook Challenge, will be taking the Dream House workshop, and I can't wait to meet her in person! 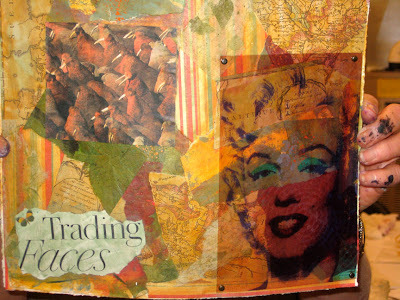 Both of us will be bringing our sketchbooks to share. OK, here are three more "stages" of the piece that I posted on December 22nd. Not sure where this is going. I've totally forgotten about the composition sketches I did before the painting. I think I'll let it sit for a while and see if it is finished or what else it needs. I hope you all had a lovely holiday! I sure did. We have loads of snow here in Vermont. A true snow day. And fortunately, we haven't lost power yet. The Sketchbook Challenge starts on Saturday, January 1. I can't wait to see what the first theme is! 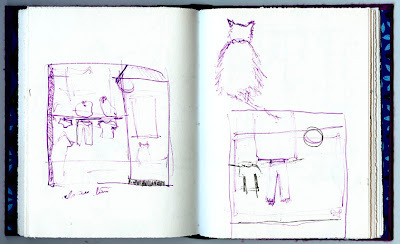 I hope you all will sketch along with us and post your pages on Flickr. 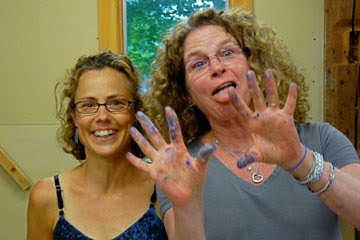 My first workshops of the year are at Ink About It in Westford, MA on Friday, January 7, and Saturday, January 8. 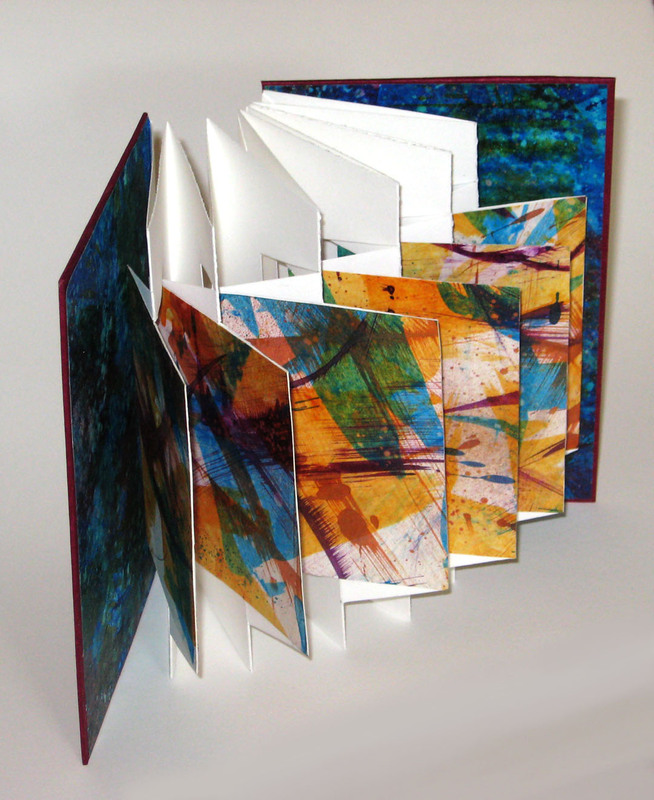 Friday's workshop is the Panel Book, a particular type of accordion structure. In Saturday's workshop we'll be making a Dream House out of foam core. I'll post pix soon. Thanks for visiting! I've been asked by several of you if I could show a few of my pieces in stages of development, and that last post was something like that. 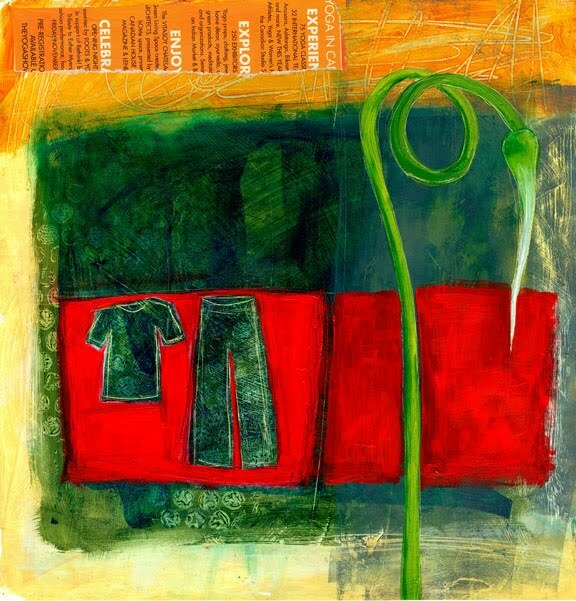 The Sketchbook Challenge has got me thinking about process, and spending more time in the development of an idea. I don't ordinarily post pix of pieces in stages because I never know where a piece is going or if it is even going to make it. I don't want to interrupt the process to go scan something (I generally scan my pieces in at least two parts and then put them together in Photoshop). But since sketchbooks and therefore idea development are going public for the Sketchbook Challenge, here is a shot at showing a piece in progress. 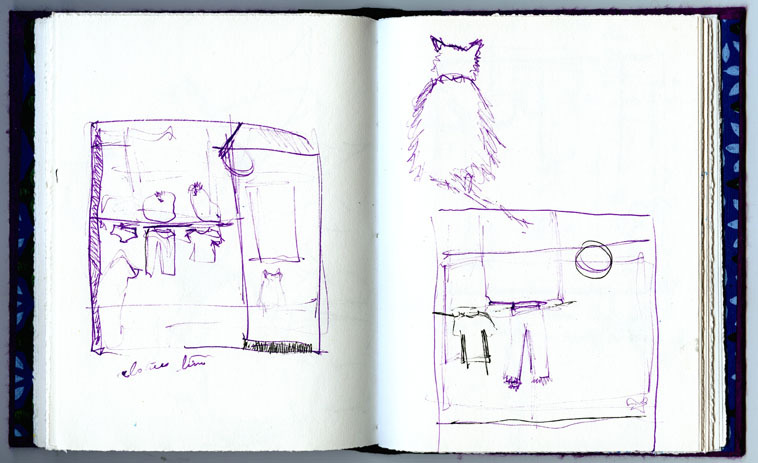 First, my fountain pen sketches in my tiny (4.5"x6") sketchbook. Then "Stage One" of a composition. 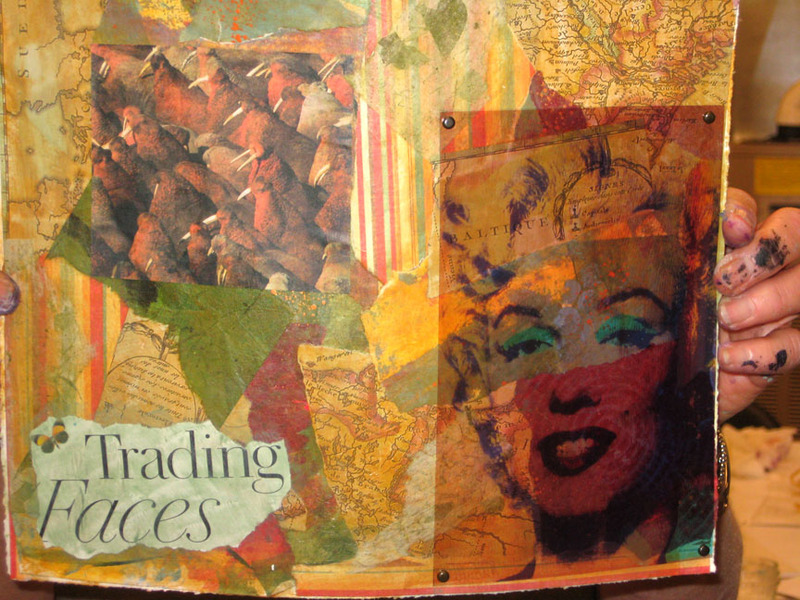 And just for good measure, a photo of some of my sketchbooks. In case you are wondering, here is how I did the "Stage One": 11"x11" watercolor paper; couple coats of gesso; lay down color (Naples Yellow); make big shapes (Jenkins Green and Quin. Gold) and press or draw texture into them; a layer of clear medium - can't remember what; scrape some Pthalo Turquoise over the green, let some green show through. Stop, think, scan, Photoshop, post a blog about it.... If this goes anywhere, I'll post the next stage. Thanks for your comments on the last two pieces. I decided that this bird one, Out On A Limb, was not quite done, so here it is in its later incarnation. I'm never sure if anything is done until it sits around a while to "cure". OK, I'm going out on a limb here a bit and showing two pieces I'm not sure are finished yet. I guess if I'm going to be posting sketchbook pages, I may just as well post unfinished or not-sure work. Thanks for all your comments and insights about sketchbooks!! 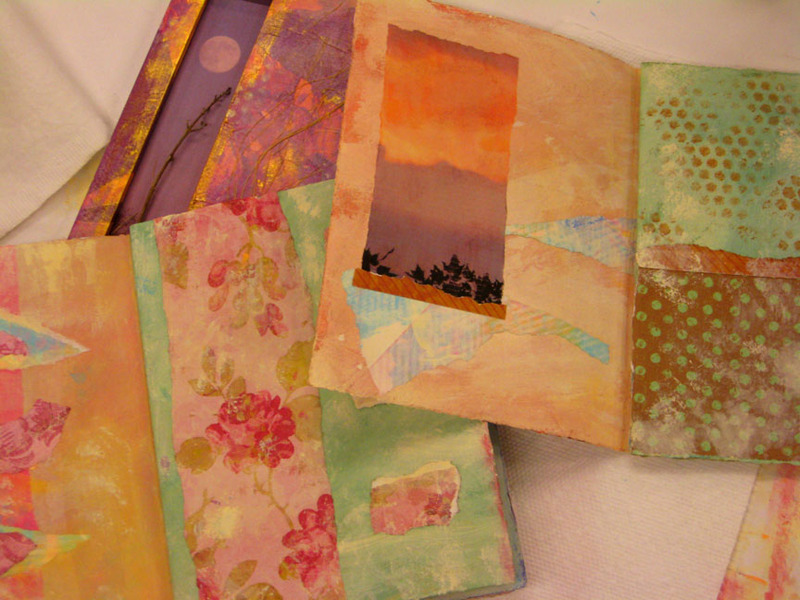 I made myself a book for 2011, and am dying to start drawing in it, but I am just going to have to WAIT! And use my other books in the meantime. No shortage of them! 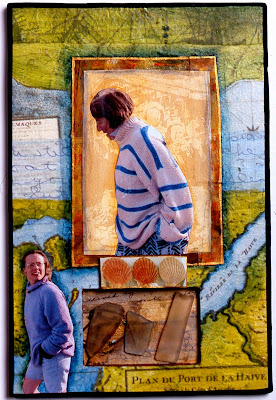 I haven't posted any of my 2011 workshops yet (and I WILL!!! 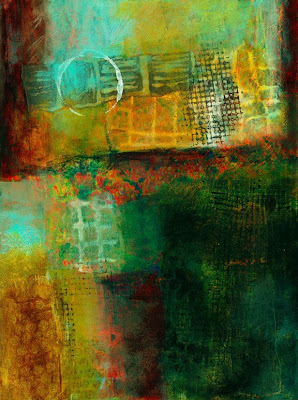 ), but so far I'm teaching at Ink About It on Jan. 7 and 8; Studio Place Arts on Jan. 28; AVA Gallery and Art Center on April 29 and June 24; Art Unravelled (site will be updated soon) on August 7 and 8; my own studio August 15 - 19; and at InView (near me in VT) sometime in early November. I'll be filling in other dates as they come up. 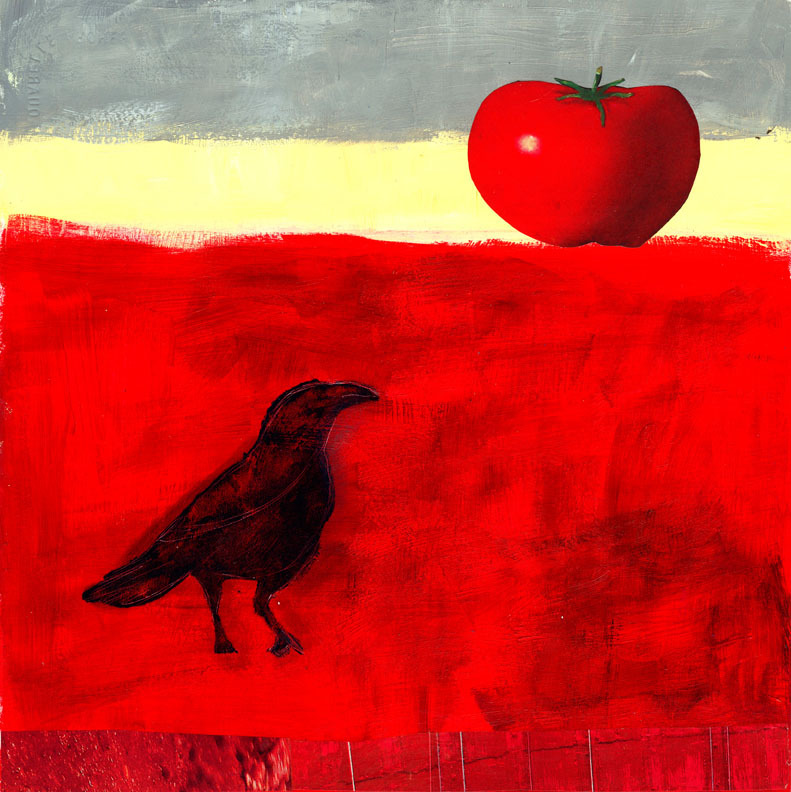 I've applied to teach at CREATE in CA in May and Chicago area in August. We'll see. This Sketchbook Challenge thing is really taking off!!! And I feel like such a newbie, since my sketchbook habits are a bit underutilized. 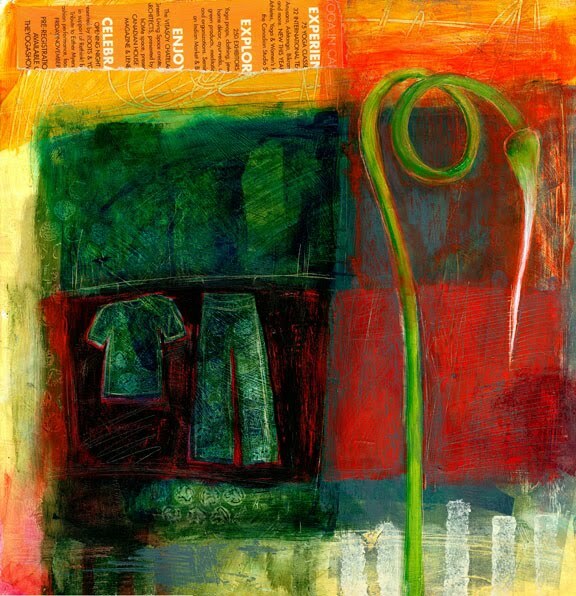 I have been using sketchbooks more often recently in order to generate subject matter, ideas in terms of Things, not just color, pattern, texture, etc. etc. We'll see where this goes! Come along with me, and please send me your comments, advice, suggestions, and constructive criticism. 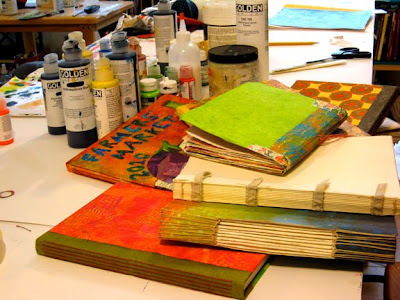 One thing I would like to know from you, if you do sketchbooks/visual journals, is: if you know you are going to show your pages to people (post them on your blog or web site), how does that affect your creative process? 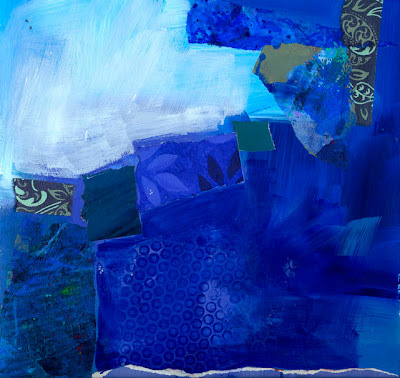 Meanwhile, back at the studio I'm still working on collage paintings. Here are a couple of birds. More on the way. Thanks for visiting! I've been invited by Sue Bleiweiss to join a sketchbook challenge group starting in January 2011. I've never been particularly good at joining groups or making art according to someone else's direction, but I checked out the other artists in the group, and they look absolutely inspiring! I'll post a reminder early in the year so you won't forget to join in the challenge. I've got to choose which kind of sketchbook I will use. Shall I make one by hand? Get a spiral bound one? 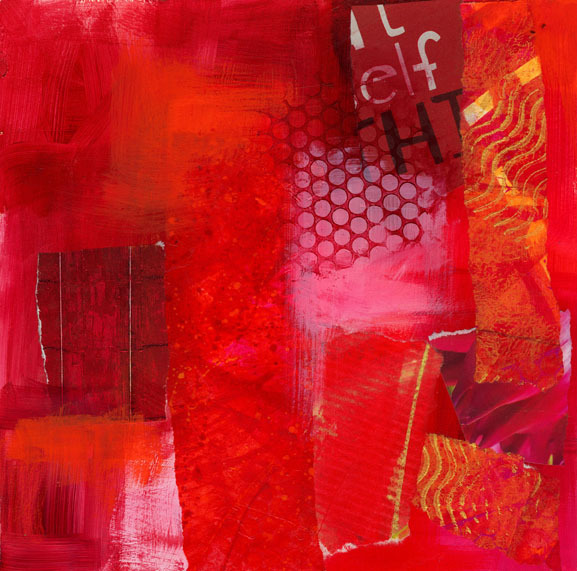 Meanwhile, I am still working in collage painting, and would like to incorporate subject matter into my work. 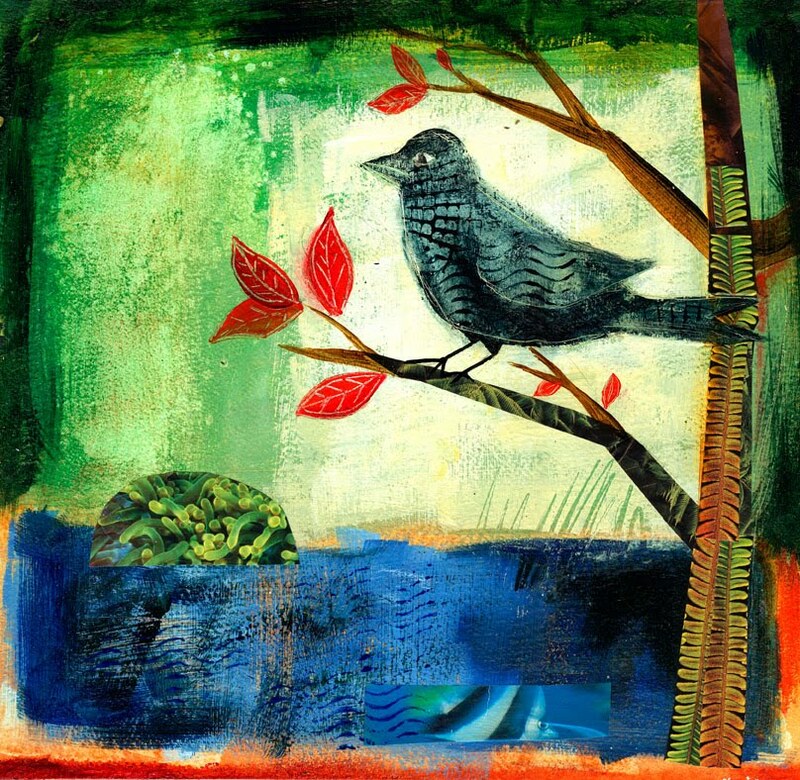 I have found Katherine Dunn's book, Creative Illustration Workshop for Mixed Media Artists, a real inspiration. Her style is SO different from mine, yet I feel a real connection to her work. Above are a couple of pieces I've done recently that are directly inspired by Katherine. I hope to evolve this into something more my own. Happy Post-Thanksgiving Weekend! 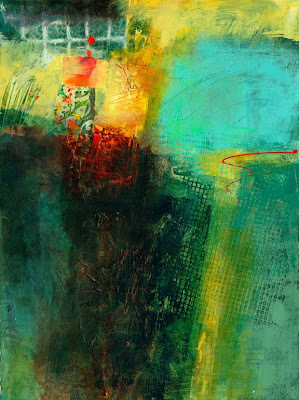 This coming year I will be offering a new workshop on Art Basics. Color, composition, and materials will be the main focus, and it is intended for students who are new to art-making, those who have been away from art for a long time and would like a refresher on basics, or anyone who wants to gain a little more confidence in the use of color and composition. The working title is "Creative Beginnings: Unlocking the Secrets of Color", but I may think of something more concise once I start teaching it. So.... 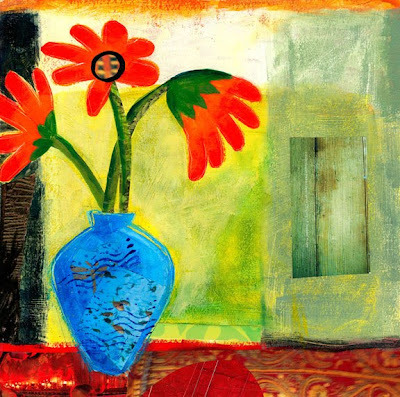 I am having a WAY fun time developing exercises that demonstrate the power of color and how it can be used effectively in composition. 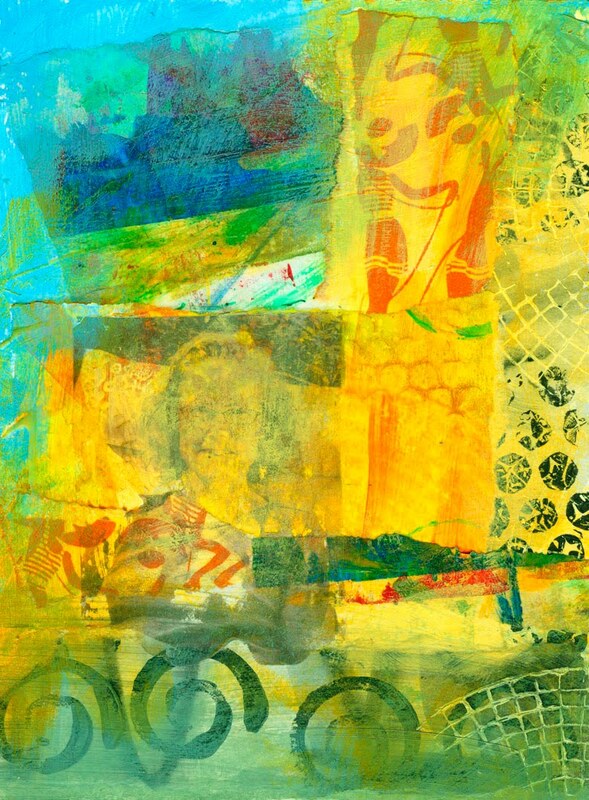 For each of the collage-paintings above, I focused on one primary color, but incorporated bits of collage and patterned paper for interest. 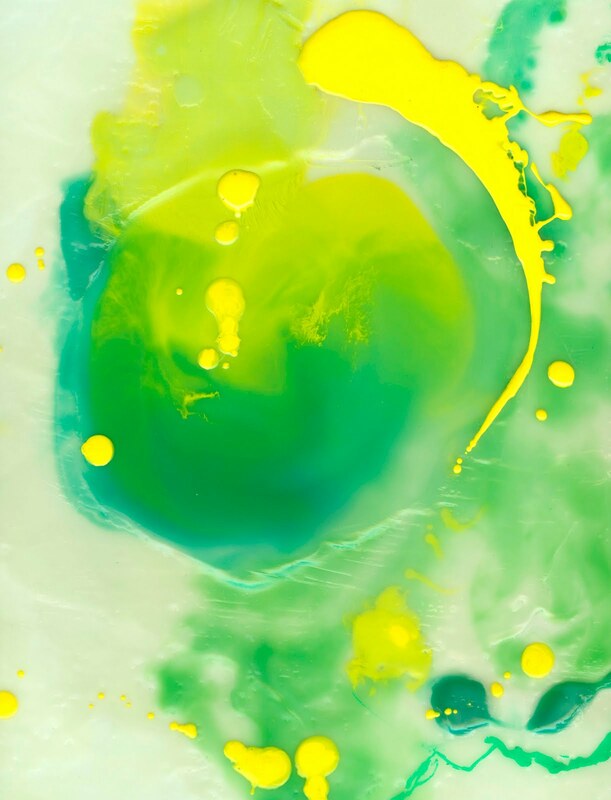 These basically monochrome paintings offer the opportunity to explore the nuances of a single color, and see how much variation you can get out of it. 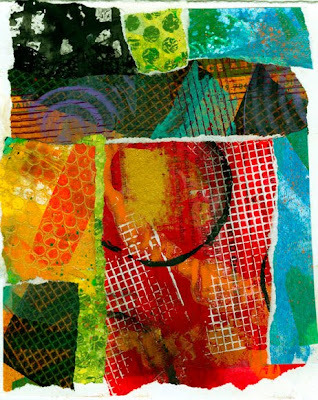 I've incorporated many of the techniques I teach in Scribble Collage in these pieces, as I will in the workshop. 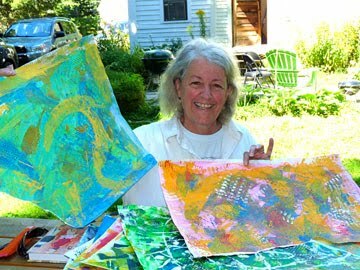 Stay tuned for 2011 workshop dates! In my recent encaustic experiments I've been trying to embed texture such that it sits just beneath the smooth polished wax surface. I'm also exploring techniques for creating line. In the top image, I used Friskars plastic texture plates to get the swirly pattern pressed into the warm wax, then I applied further layers of encaustic medium, and scraped it back with a razor blade. The circle is made by incising a line into the warm wax, then filling it with black pigmented encaustic, and scraping it back. 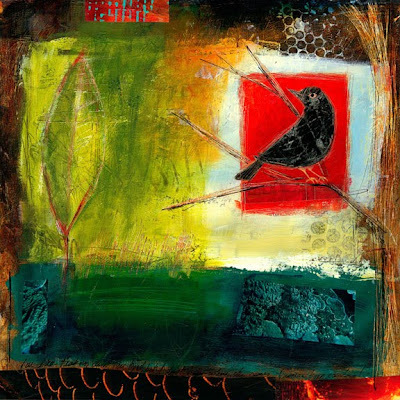 In the second piece, I scraped texture into the first layers of encaustic with various tools, then rubbed oil paint into it. 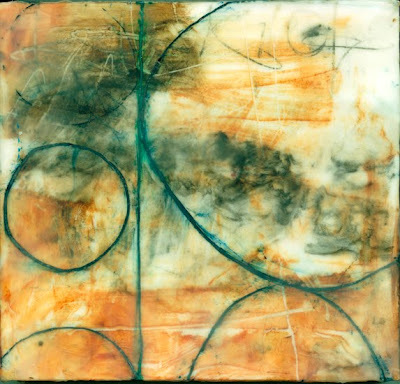 After another coat of encaustic medium was applied, I incised the lines, filled them with paint, and applied yet another coat of medium. I am not looking for any particular result at this point. My experiments are just that, experiments, in search of whatever comes out. I got a sheet of birch faced plywood and had it cut into 8" squares. That makes 72 panels! Before applying the encaustic, I'm laminating each panel with a sheet of watercolor paper to give it a white background. Stay tuned! 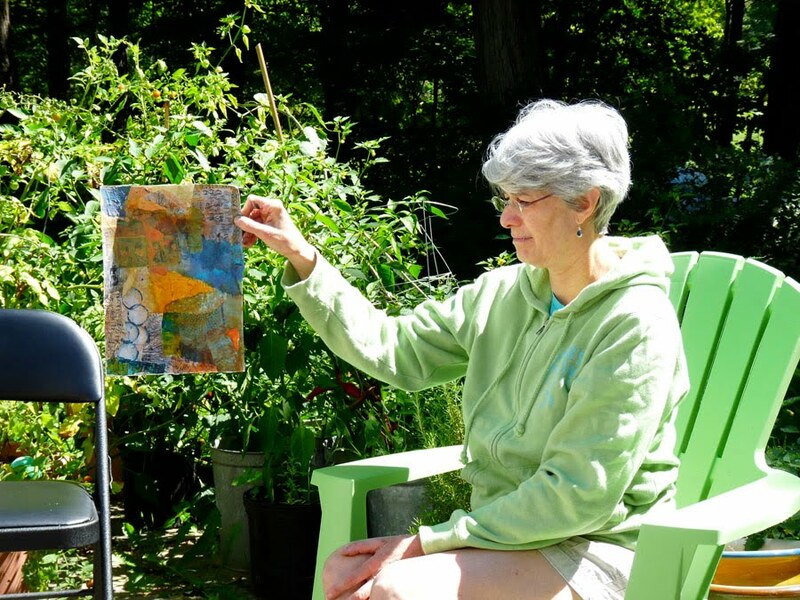 I am finding these two books VERY helpful and inspirational: Encaustic Art, by Lissa Rankin, and The Art of Encaustic Painting, by Joanne Mattera. 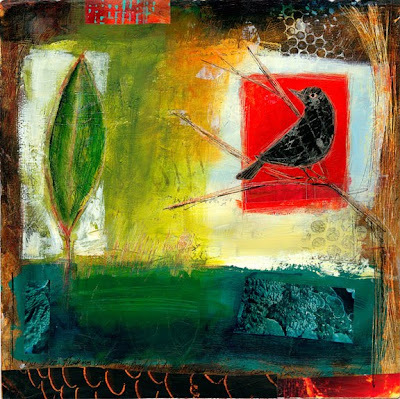 I'm also taking an encaustics and collage workshop at Studio Place Arts in Barre, VT, on November 12. 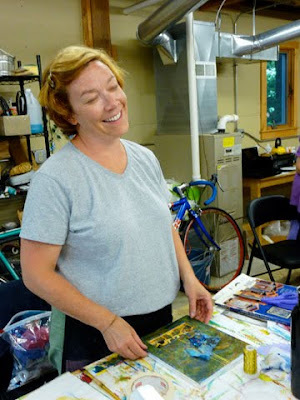 Beth Kendrick is a fabulous teacher! A couple of new pieces I developed from workshop samples. I'm not sure if either of them is finished, but they are both finished for now. I'm teaching Scribble Collage as a two evening workshop tomorrow and Thursday in Manchester, VT, through Green Mountain Academy. Then next week I'm off to The Queen's Ink in Maryland for my five workshops in four days stint. 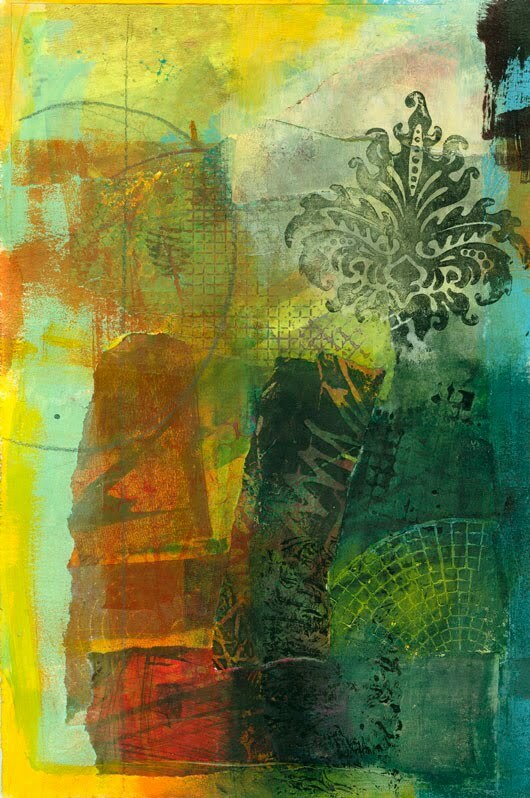 Meanwhile, I'm focusing on making collage paintings and still experimenting with encaustics. All good fun and hard work! Here are a few pix from the Scribble Collage workshop I did at Studio Place Arts in Barre, VT last Friday. 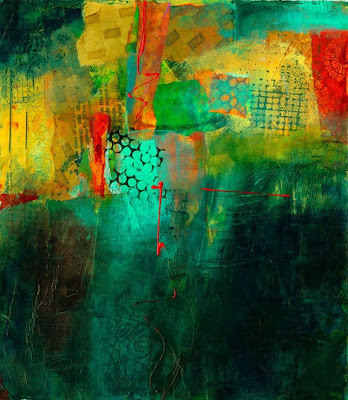 The top photo is a collage I did: I challenged myself to make a collage with ONLY scribble painted papers, no layers and layers of paint, as is my usual m.o. 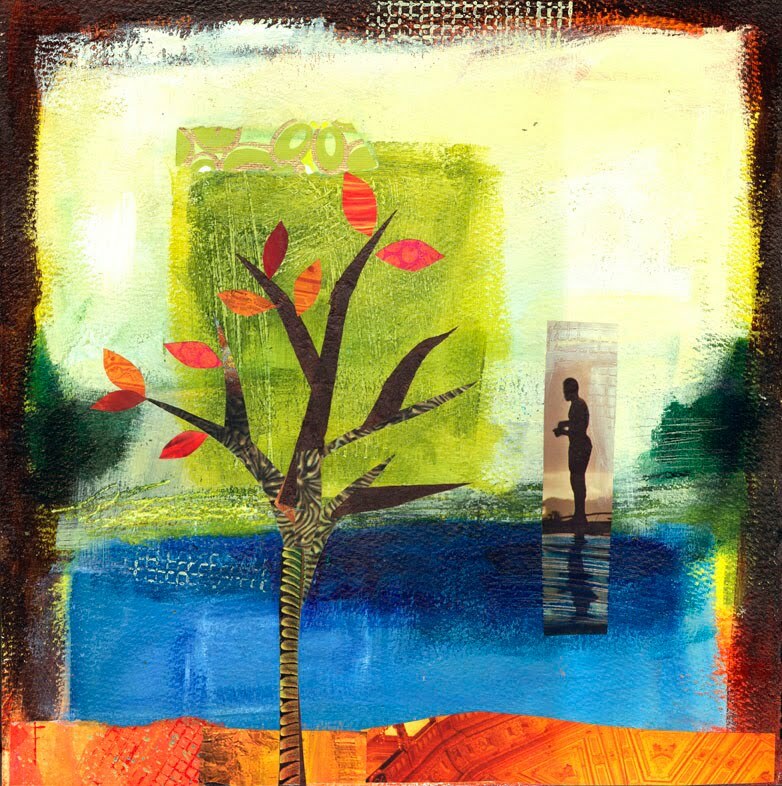 I found myself paying a lot more attention to composition, but it didn't seem to cramp my intuitive style. 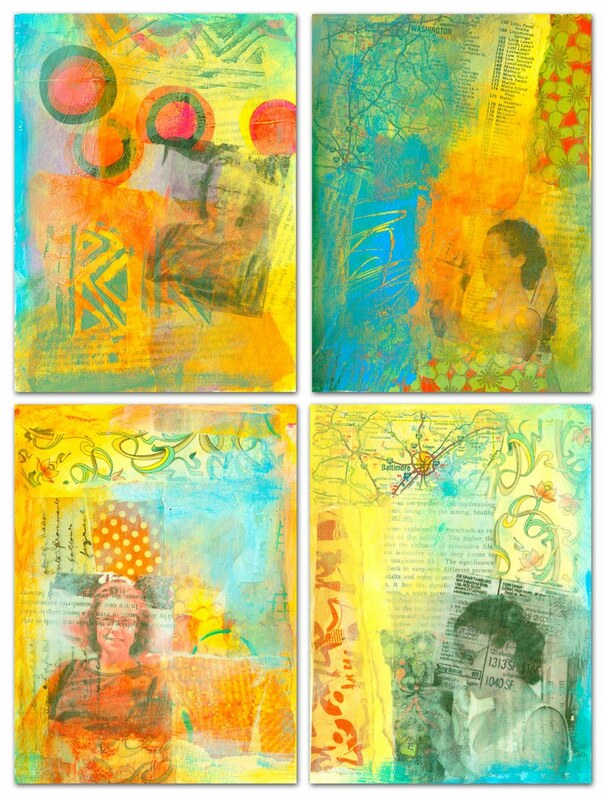 Five fabulous and creative women came to the workshop, and we spent the whole rainy day happily making gorgeous papers and then using them in collage. 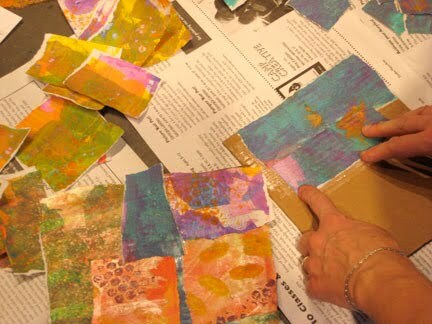 All of the participants claimed to be beginners at art, but they showed sophisticated visual sense, and picked up on the techniques quickly. I love teaching this workshop! The next one I'm teaching at Studio Place Arts will be on January 28. 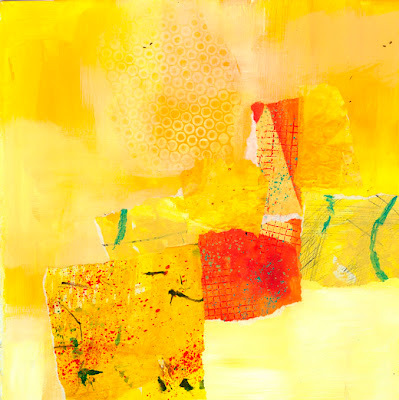 I'm offering an Art Basics workshop focusing on color, composition, and materials, and using paint and collage as the medium. More about that as I develop the projects and themes. 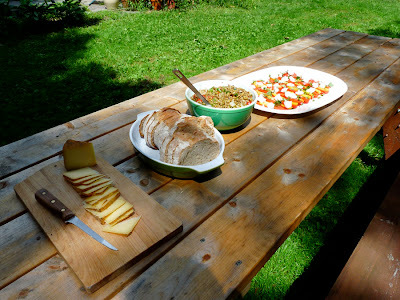 Thanks for visiting my blog! And thanks to those of you who have taken my workshops! Yes, it's time to visit The Queen's Ink, in Savage, MD again!!! This time we're offering FIVE workshops in THREE days, November 4, 5, and 6. Yikes!!! We'll begin with Scribble Collage on Thursday, all day; then in the evening we'll do Collage in a Box, which is a handmade hinged box with a set of collage note cards. On Friday we'll make a panel book - a special type of accordion book, in which you can use your scribble painted papers, or anything else to decorate it or add content. 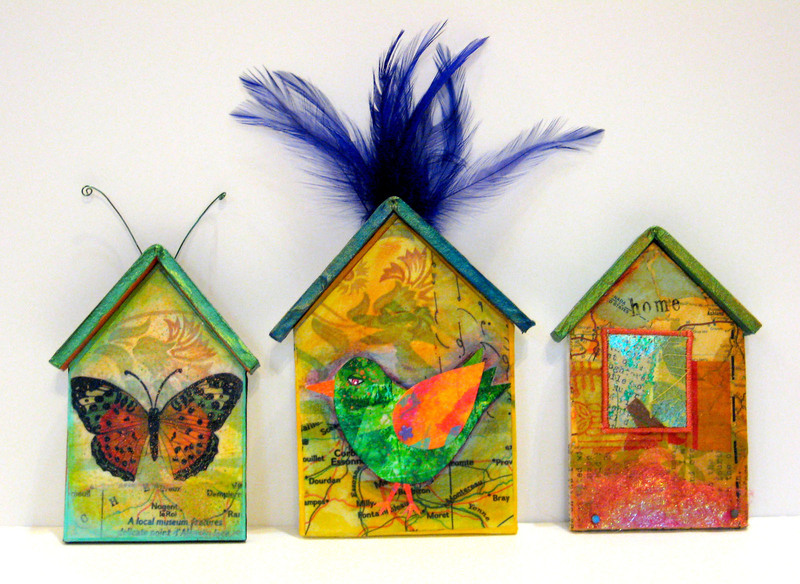 On Saturday we're going to make little dream houses in foam core, using collage and found (or purchased) objects to bring the dreams to life! Saturday evening is a new workshop, the Jewel Box, which incorporates paper and glue-gem mosaic. I'll post a close-up of the mosaic here, to whet your appetite. Hope some of you can make it!! This Saturday, October 9, I am teaching a workshop at Ink About It in Westford, MA. 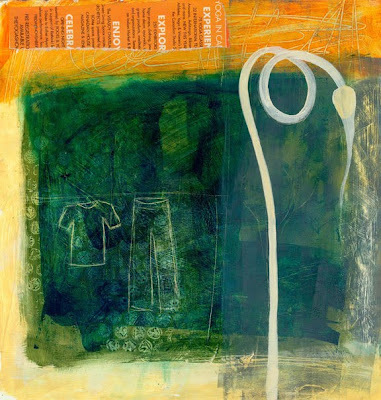 We will be using foam core as a substrate for making dimensional collages. There are still spaces available, so check it out if you live within driving distance! 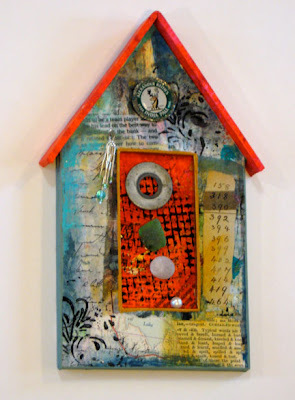 Here are some examples of foam core collage projects. Ink About It carries a huge variety of papers, stamps, and supplies for paper crafting of all sorts. I love teaching there! 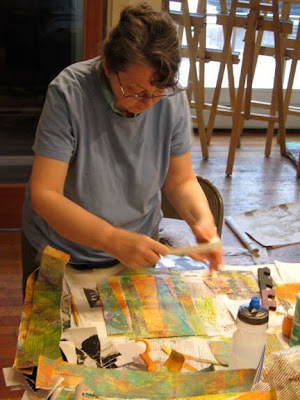 I took a one-day encaustics workshop back in April at the Studio Place Arts in Barre, Vermont. 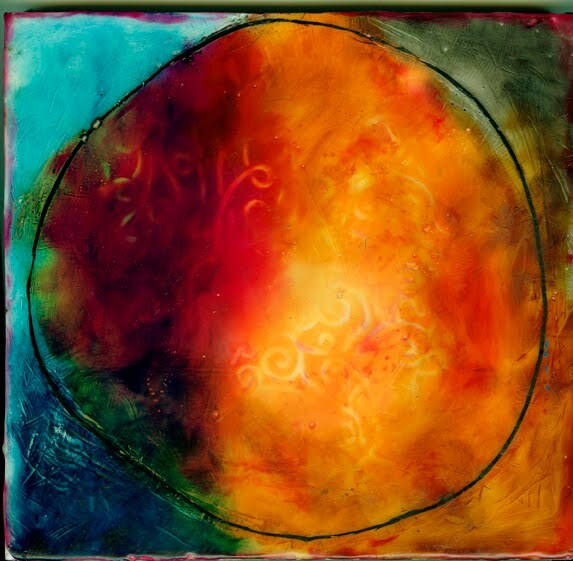 I got OBSESSED with it, of course (everyone who tries encaustic seems to get obsessed). 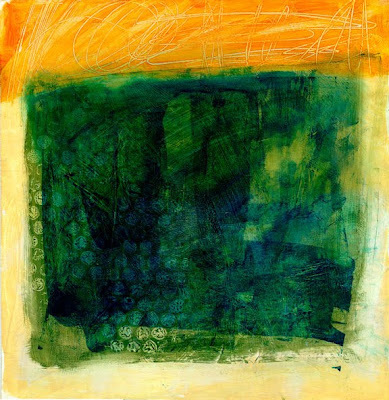 Eventually I set up a workspace in my studio devoted to encaustics, and have been experimenting a bit. A little bit, that is. Between collage-painting, teaching workshops, and still doing some freelance art, I haven't carved out nearly enough time for this, but little by little... baby steps. So today's project was to experiment with ways of getting a smooth surface and translucent colors. I set up a heat lamp (the one I used to brood baby chicks this summer) over my substrate (plywood laminated with hot-press watercolor paper) to heat it up before applying the beeswax and encaustic medium, and I kept it warm between applications. Way more experimenting to do with this heat lamp set-up, but I did want to share this one little result. 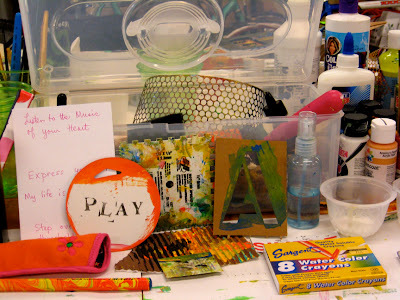 For the forseable future, my encaustic "pieces" are all to be viewed as playgrounds. Experiments. Not even works in progress, just playing around to get a feel for the material and practice techniques. 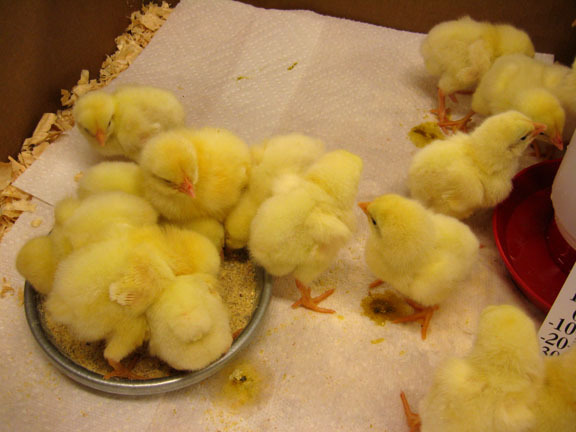 OK, I mentioned the chickens. Here is a picture of them on their first day at my house back in July. 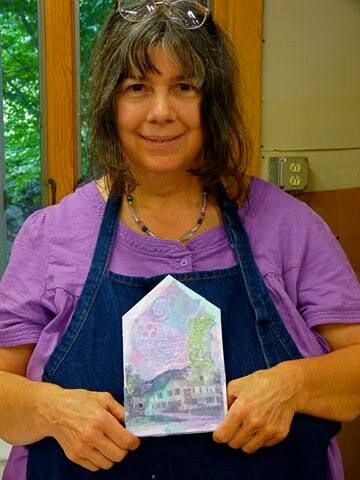 Earlier this month I had the pleasure of being a visiting artist for two days at the Long Trail School, a local private middle school and high school. The art teacher there, Anharad Edson, has taken a couple of my workshops, and I just love her to pieces! She is so great with the kids and super creative in coming up with projects for them. I admire art teachers who can make a meaningful lesson happen in a 38-minute period, and I've worked with a bunch of them in my area. How they do it is a mystery! 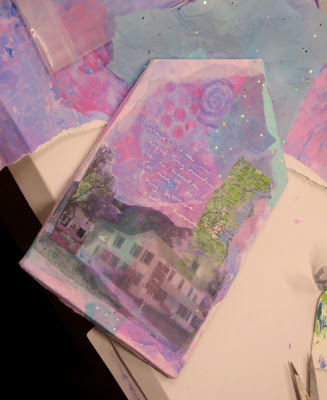 We decided to teach the kids my basic collage technique, and then show them how to do an acrylic gel transfer (which is demonstrated in Collage Journeys). Since the acrylic gel has to dry overnight before the transfer can be completed, Anharad had the kids finish their projects in subsequent sessions. But they all made really good collage backgrounds, and they all got the wow factor of gel transfers. 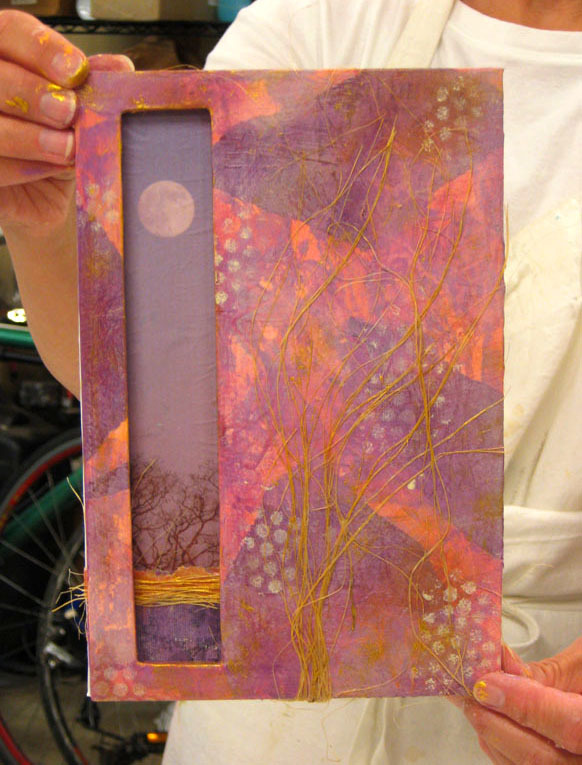 I'm posting a few pieces that I did as demonstrations. 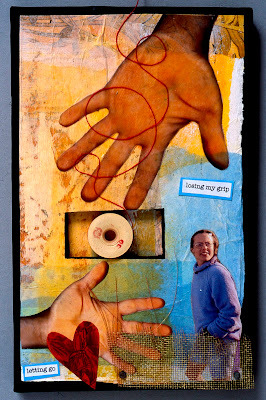 If you haven't done gel transfers and want to know how, go to pages 81 and 89 of Collage Journeys for two different approaches, or Google it! For these collage studies/demos, I used photos of myself printed out on an ink jet printer. The backgrounds are collage and paint. Fun fun fun! 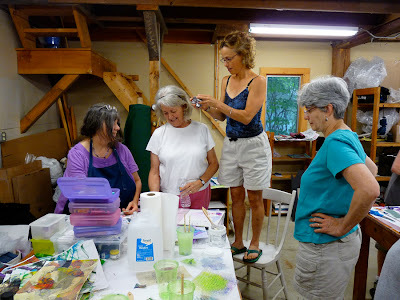 I promised to post more photos from our Collage Journeys Workshop here in my Rupert, Vermont studio. Fortunately, one of the students, Gretchen, took fantastic photos and sent them to me on disk. The first one is the opening page of the journal Gretchen made after the workshop. Here are a few pieces I have been working on post-Rupert Workshop. There are about half a dozen more in progress, and I work on them all at the same time, which is probably evident from the similar color scheme and compositional elements. 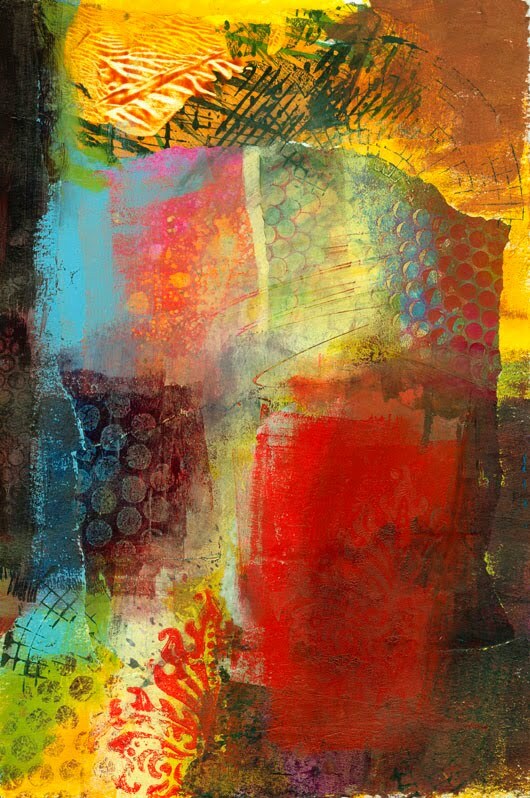 My process begins with a painted or collage "start" - random painting, collaging, building up pattern and texture. Then I proceed to add layers of paint and collage, obscuring much of what came before, but adding new elements. Often a piece will change course dramatically several times over in the course of its journey towards completion. Completing a piece in any one work session is never the object. 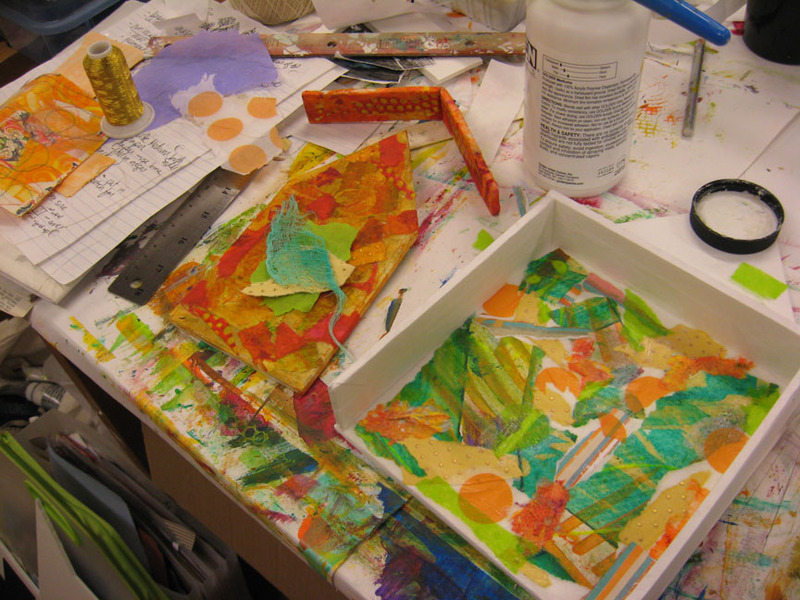 I find that if I keep focused on the process, pieces have a way of resolving themselves, or not, in their own time. Art Unraveled proposals for workshops are due next week, and I'm proposing a workshop that focuses on this process of layering paint and collage. 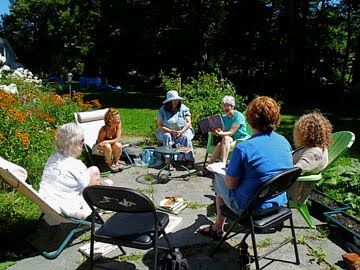 Of course, I'll include other tried-and-true workshops in my proposal as well. I'll keep you posted on that. I think I'll try another color scheme for the next group. I love this quinacridone gold and turquuoise thing, but I should probably challenge myself in the color department. Any suggestions? I love your comments!! 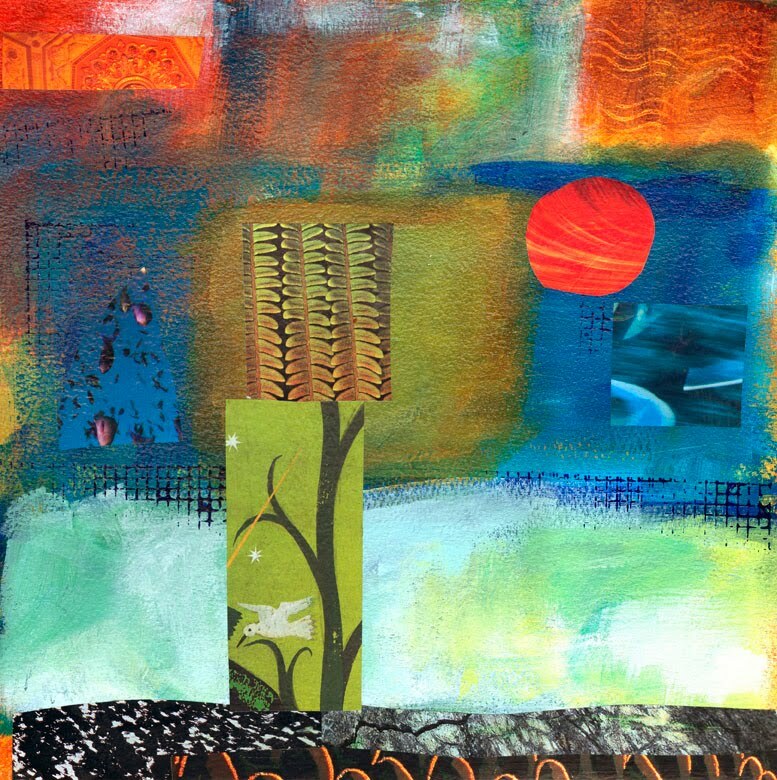 I am having SUCH a great time with the students in my Collage Journeys workshop this week. What a creative bunch! 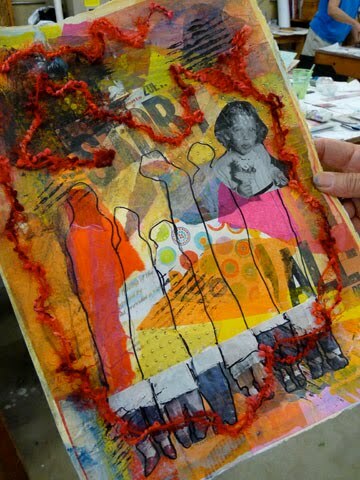 ON Monday we did Scribble Painting, Tuesday we we explored personal text and image relationships as well as composition; on Wednesday we made collages with foam core; and today everyone continued work on their chosen project. Gretchen collaged in a journal she had begun, as did Deborah. 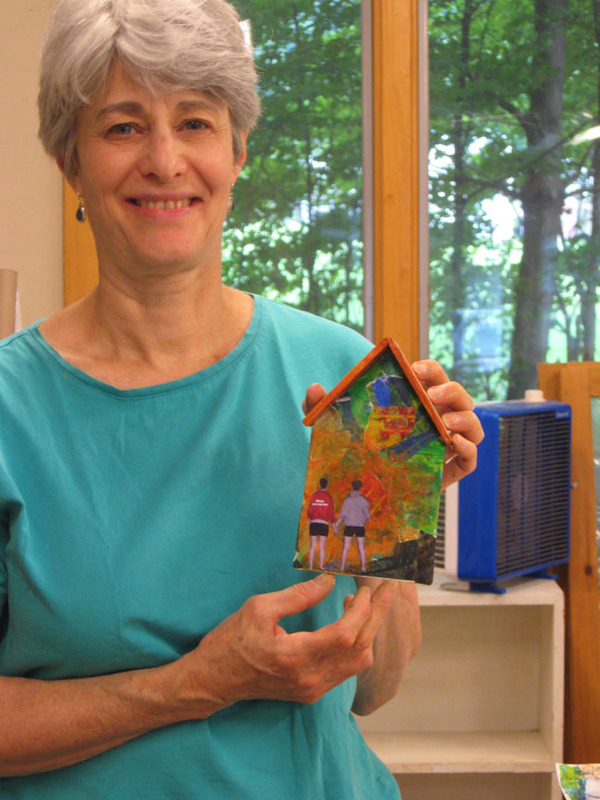 Marianne continued with the foam core constructions, while the rest worked on collage / paint compositions. Tomorrow we wrap up with some show and tell and discussion. I have lots more pictures, but here are just a few to give you a flavor of the creativity we all experienced.